It's Au gust, let's do like the French and take a little vacation from Paris. You may already know that Richard Wright kept a charming little farmhouse in nearby Normandy - and it's great to get proof that it's still standing. One of our tour participants followed this particular trail of Black history outside Paris and came back thrilled. 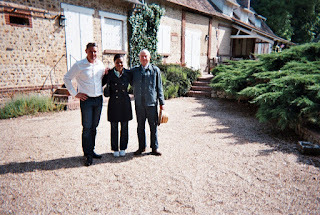 After a quick half-hour train trip from Paris, they were met in the tiny quaint village by a very hospitable young driver/guide. 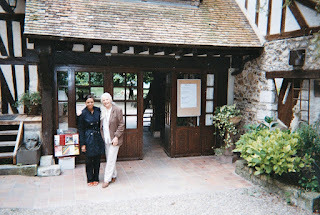 Alexandre had helped me find and make arrangements for them to visit Wright’s old farmhouse. The guardian of the place, Mr. Heloin, was an old acquaintance of the Wright family and took great pleasure showing our American travelers around the farmhouse and regaling them with stories, translated loosely by their guide. Wright loved the country life. You may have heard the story of him bringing his prized farm-grown potatoes back to Paris and handing out baskets of them to his friends at the Café Tournon. No potatoes during this 2009 visit, but our travelers got their fill of delicious cherries, straight off the tree. haiku at the end of the 50s. It’s still a gorgeous bucolic retreat built around an 11th century mill. Goats roam the grounds, a serene river flows nearby… what more could the writers, artists and musicians who spend a week or a month here need to create? Not much, if you read the haiku that blossomed from Wright’s imagination, penned in his own little room at the end a row of cottages. The owner, Ms. Lipinska, is a lovely woman – the same one who had originally invited Wright to make this his home away from home. And the same who graciously hosted the Mississippi TV crew I was part of back in '94 when Madison Lacy was filming Black Boy. Over a fine dinner of homemade lasagna, Ms. Lipinska enchanted our travelers with more memories of Richard Wright and the impressive list of artists who have taken up residency there. She even showed the letter Wright had written her after his stay. It’s not much of a stretch to imagine Wright relaxed and flexing his creative muscles in this retreat far from the maddening throngs of Paris. Back to Paris, now, to the Roaring '20s when there was no hotter place for Black culture outside of Harlem than on the lower slopes of Montmartre. In fact, the vibrancy and influence of the post-war Black Paris community has never been equaled. 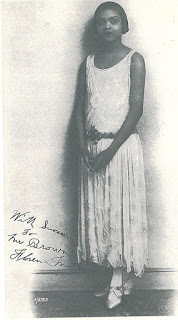 Imagine it’s around 1925. 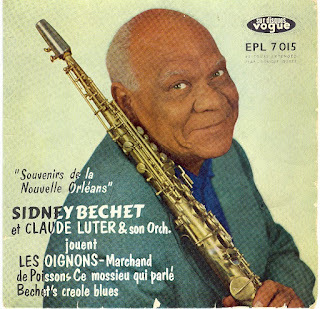 You stumble out for your morning paper and saxophonist/clarinetist Sidney Bechet ambles by, on his way home from playing at Bricktop’s legendary club. Or, after a work-out session at the gym run by Foreign Legion aviator Eugene Bullard, you down a quick and copious meal made cheaper by the mighty American dollar. As night falls, you put on your duds and head out to make the rounds of the many clubs where fellow African-Americans rake in more money than French musicians. 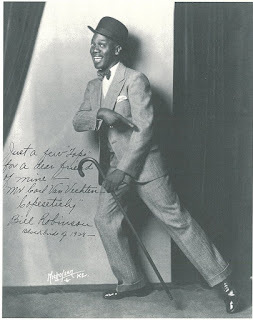 Had you been there, you’d have crossed the path of a young Langston Hughes working on his jazz poetry, or reserved a table at Josephine B’s chic but not cheap Chez Josephine restaurant. You might have had your suits made by R.D. Miller, a brother’s shop just down the street from the Moulin Rouge. Of course by now you want to know and see more, right? Set your DVD recorders or VCRs for August 26th : PBS will be broadcasting the much-anticipated documentary ‘Harlem in Montmartre’. 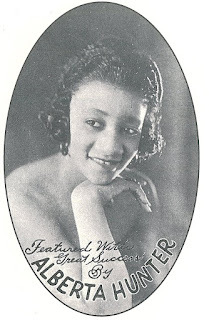 The film covers jazz in Paris from 1920-45. Not only will it delve into the revolutionary African-American experience there, but it will pick at that burning question: how did African-American music become French?? As a primer, here are a couple of key players: the Depression, a protectionist law that limited foreigners playing in clubs, two fresh-faced musicians - Stephane Grapelli and Django Reinhardt - trying their hand at the totally new phrasing and style they'd been listening to at Bricktop's, and, of course, World War II & the Nazis. The documentary is the fine work of Emmy Award-winning filmmaker Dante James (series producer of Slavery and the Making of America). You can read Kam Williams’ interview with him here. Wow! You make me feel as if I was back during that time. Great story telling. Really great site. Please update! Julia, wonderful blog! Can you tell me the name of the Lois Mailou Jones painting pictured on the blog? Love your site! I'm currently shooting a documentary on the jazz legend James Moody, who lived here in the late 40's - early 50's. Have any insight on jazz in Paris at that time? Incredible! You help make myself feel like I seemed to be returning during that period. Excellent report showing.